What are the biggest hazards of life in the Amazon rainforest? Many outsiders might peg snakes at the top of the list: the region is home to dozens of venomous snakes, among other fearsome reptiles, fish, insects, and mammals. But the Yawanawa, a tribe of 1,250 people living at the heart of the Brazilian Amazon, have never regarded snakes as much cause for alarm – not even those whose fangs pack a potent punch. In fact, the community hasn’t seen a single death from venomous snake bites in its history, thanks to a deep knowledge of over 2,000 medicinal plants that’s been passed down for generations. Luckily, Tio Luis’s teachings had done the trick, and both patients survived as a result. But that might not always be the case – not without efforts to prevent these traditions from disappearing with the last generation of medicinal plant masters. Losing this kind of traditional knowledge threatens more than just local community health; it also hampers the global fight against climate change, which relies on keeping the Amazon’s forests standing and soaking up massive amounts of carbon dioxide. Indigenous and traditional communities like the Yawanawa are the world’s most effective forest stewards, and preserving their understanding of nature and its resources ensures that they can sustainably manage and protect their forest homelands. That’s why the Yawanawa have captured their long-held botanical expertise in a new illustrated field guide that helps members of the community identify and use life-saving medicinal plants. The poster, released in late March, details 21 medicinal plants the Yawanawa have traditionally used to treat poisonous snake bites. There’s “Runa Nushi,” a creeping vine with smooth, almond-shaped leaves; “Pitsuru Pãni,” with waxy, canoe-shaped leaflets alternating along straight branches; and “Runa Kene,” whose oak-like foliage is especially adept at soaking up venom. Each entry features an artful botanical illustration, along with reference photos and descriptions in Portuguese. You won’t find any of these names on Google, but over many generations the Yawanawa have slowly recognized and mastered their life-saving properties. Today, with the help of Forest Trends’ Communities Initiative, the Yawanawa are expanding their network of “living pharmacies” by building new medicinal plant gardens in their villages and by cultivating these plants in agroforestry systems throughout the surrounding tropical forest. One of these gardens is devoted specifically to plant species that help treat poisonous snake bites. Part laboratory and part classroom, each of the living pharmacies provides a space where elders like Tio Luis can impart their vast expertise to young Yawanawa through hands-on teaching. This inter-generational exchange will be made easier by the new field guide, which is a product of a partnership between the Yawanawa Socio-Cultural Association, Forest Trends, and the Brazilian Agricultural Research Agency (EMBRAPA), with funding support from the IKEA Foundation and the United States Agency for International Development (USAID). 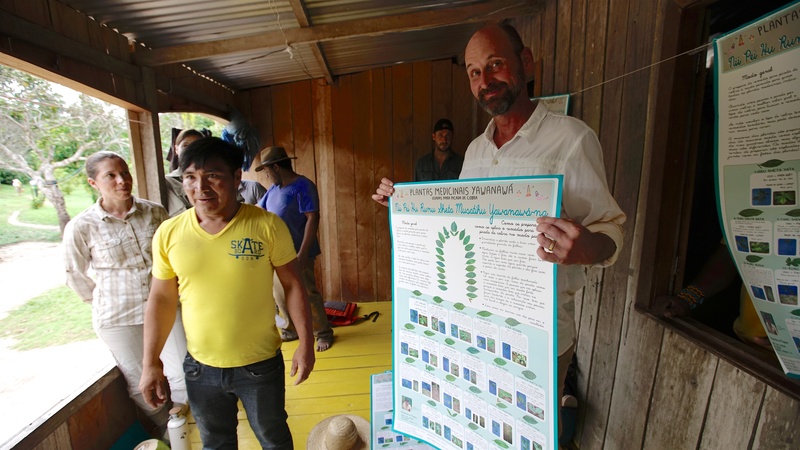 The guide was released at a community gathering in Escondido Village, one of the small settlements that dots the indigenous tribe’s sprawling rainforest territory of approximately 800 square miles. In attendance were Augustinho and Kashahu, the two recent snake bite survivors, whose presence is a testament to the project’s importance. Beto Borges, Director of Forest Trends’ Communities Initiative, was on hand to celebrate the launch of the new publication. He points out that the Living Pharmacy led by the Yawanawa, as well as a similar botanical initiative being undertaken by the Surui indigenous community to the east, have impacts that go far beyond saving a handful of lives. That last part is especially notable, since all of us rely heavily on the Amazon’s vast biological cornucopia for many of our medicines – not to mention a dizzying number yet-to-be developed. For that reason, the whole world should be celebrating with the Yawanawa and rooting for many more successes to come.